Hi RGL crew! I’m back after an unforeseen shortage of working laptops in the Sydenham area. 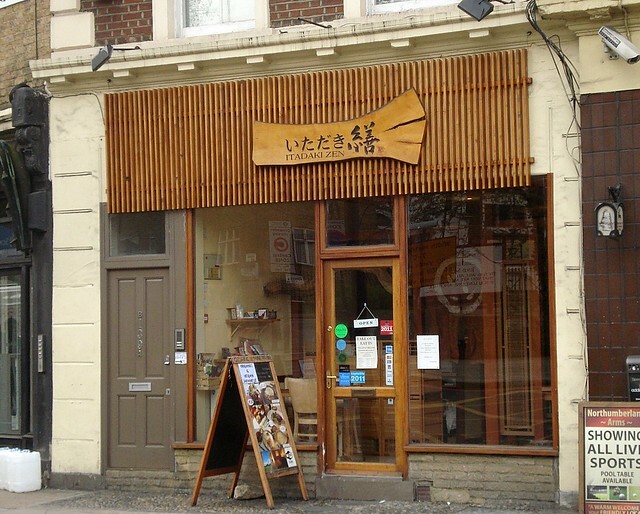 We've had a productive week, so let's crack on with our featured article Itadaki Zen, a vegan Japanese restaurant in King's Cross. It's a solid, reasonably priced lunch option for the area with good tempura and bento boxes. In Lloyd Park, Croydon, a morning soup can be avoided if you take a route straight through what is known as Parklife Cafe! As our new page for it describes, it's open for breakfast and there are plenty of tasty alternatives to soup, enough to give you an enormous sense of well-being. There's a new page for GT Flavazs "N" Spices, which is not in fact the newest grime remixer on the block but a friendly Guyanese bakery and takeaway in Anerley. Thirteen stops up the Overground to Shoreditch, you'll find Lyle's, a Michelin-starred restaurant in the vein of St. John, which our reviewer enjoyed a great deal. Also new to RGL is Brixton's Booma, a restaurant whose gimmick is curry-and-craft-beer pairing. A match made in heaven? You'll have to read the article and find out. Meanwhile down in Beckenham we have new pages for Indian restaurant Chai Naasto, and Poached, a small cafe where you have one (1) guess as to what sort of eggs our reviewer had for breakfast. There's an update to the page for Bombay Burrito in Angel (now with vegan options!) and the Indian YMCA canteen in Fitzrovia (now with Rice Krispies!). Lastly, Salt & Pickle in Crystal Palace has closed after less than a year - the final outpost of the Good Taste empire has now left the Triangle. 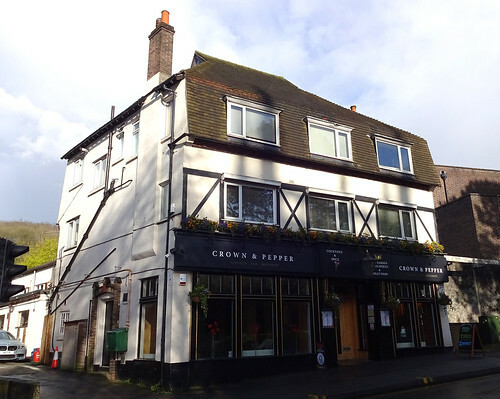 This week's featured article is for the Crown and Pepper in Caterham, a pub that incorporates an Indian restaurant at the back. They also have a bar menu if you don't fancy the full sit-down experience - try the okra. New this week, we have the Union Jack pub in Southwark, that perhaps isn't living up to its potential beer-wise, and the French House restaurant in Crystal Palace, a cheerful establishment themed around '60's Francophone pop music (the drinks menu looks pretty good too). There's an update for the Prince George (just off Queensbridge Road in Dalston) following a visit, which reveals its all-important lime and soda pricing to be significantly cheaper than the Union Jack's. 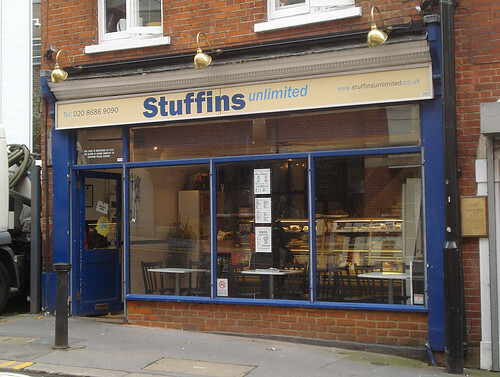 Finally, Fujiyama in Brixton has closed: lovers of spinach ohitashi will have to venture elsewhere. A quick update this week to let you know about our new featured article, for Carioca in Brixton. 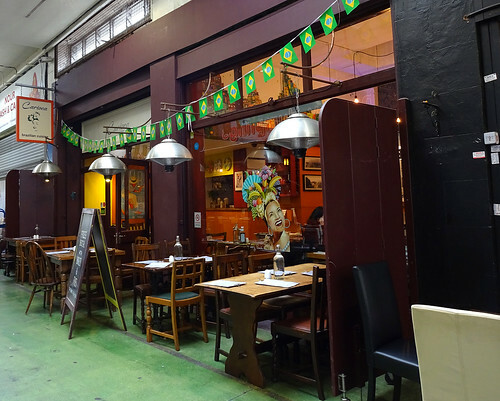 It's a small Brazilian restaurant in the covered market, whose owners, judging by the decor and the website, are extremely keen on fruit-adorned singer Carmen Miranda. 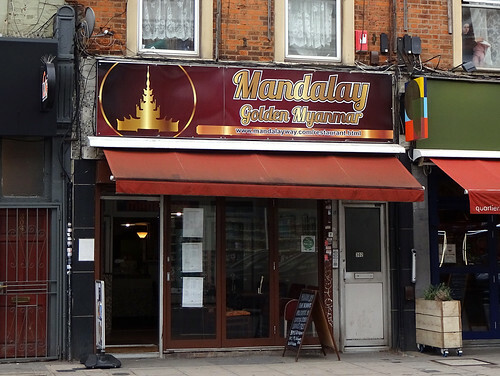 There's also a new page for Vietnamese cafe Banh Mi 108 on Feltham High Street. The significance of the 108 is a mystery to me - perhaps the name is a tribute to the atomic number of the transactinide metal hassium? I'm more of a seaborgium fan myself. Anyway, bubble tea and banh mi await you in Feltham! Hi there welcome back to another week of interesting things to drink, eat and do south of the river (and maybe like one or two things to the north -- though that lack is entirely my fault by the way). So the featured article this week is Senzala, SW9 8PS, which is a creperie in Brixton Village Market, that burgeoning community of little foodie units. There are sweet and savourity galettes and crepes served up by Brazilian chefs, and if you're vegan you'd usually steer clear of this kind of thing, but fear not for they do some vegan options too that sound great. 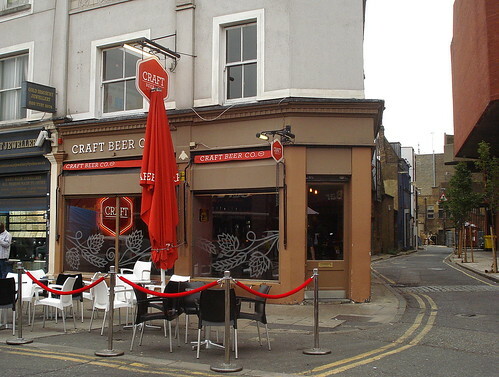 The new articles are: We Brought Beer, a branch of a craft beer shop/stall in Tooting, where you can drink on the premises as well; Frydays, a fish and chip restaurant in Norbury (do you see what they did with the name eh? ); and Som Saa, a well-reviewed Thai place in Whitechapel/Spitalfields, so do go read Kake's review, as it sounds great. 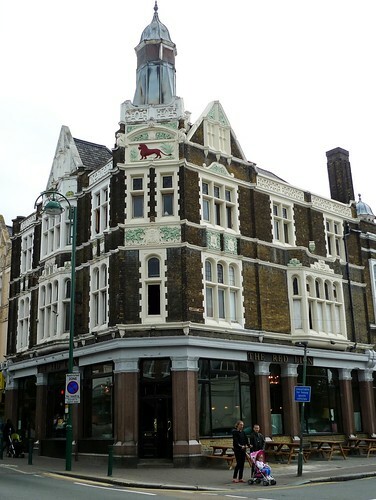 There's an update to The Old Dispensary pub in Camberwell. The Shooting Star near Liverpool Street is now temporarily closed for refurbishment and will reopen under a new name. Finally, one reported permanent closure is Maotai Kitchen in Chinatown. Evening all! A bumper week to catch up after the Bank Holiday. 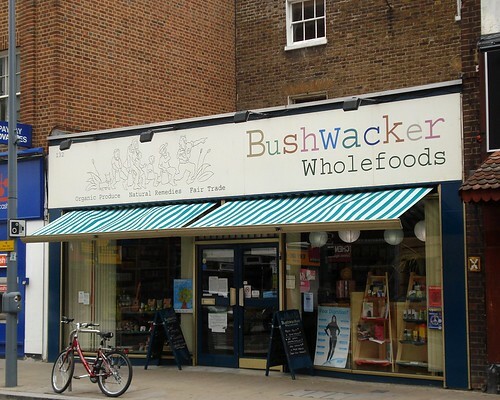 This week's featured article is for Bushwacker Wholefoods in Hammersmith, which stocks a whole range of vegetarian groceries including Taifun tofu (I wonder if they have curry and pineapple flavour? New new new! Craft Tooting is a small craft beer shop by Tooting Broadway station. Further up towards Wimbledon Park we have more beer at the By The Horns Brewery Tap, while the Pear Tree pub in Purley has little jars of beer in front of the pumps so you can see what colour it is (I love it when pubs do this). Not quite so new but existing under a different name: The Aleksander in St Margaret's is now The Alba. The page for Lion Inn in Thornton Heath has had an update, as have ones for the Sugahill cafe in Sydenham and Imperial China on Chinatown's Lisle Street (which seems to be *the* place to meet your blind date?). Places *not* to meet your blind date, unless you want to hang around outside a now-closed pub: the Red Herring pub near St Paul's, and the Devonshire House Wetherspoons in Crouch End. Finally, pre-gig Brixton favourite the Trinity Arms is temporarily shut for a refurb. It's planned to reopen in August, hopefully in plenty of time for any attendees of 'Progress Wrestling: Chapter 36 - We're Gonna Need a Bigger Room Again' wanting a pre-bout pint of Ordinary. Evening all, hope your Bank Holiday was pleasant! I spent mine looking at my local supply of anatomically incorrect dinosaurs in Crystal Palace Park. 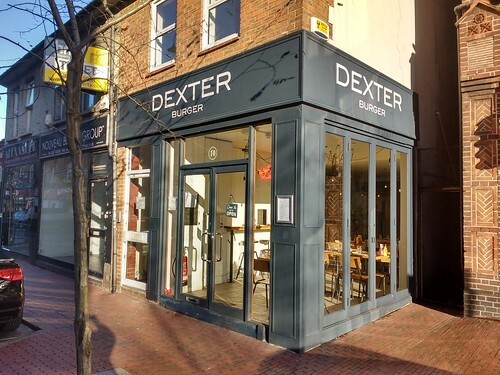 This week's featured article is for Dexter Burger in Purley, home to interesting veggie burgers with a high rating on the all-important Bun Structural Integrity scale. We've got new pages for Lamberts in Balham, a restaurant specialising in seasonal British produce, and Tandoori Naan And Chapati, a bakery in Walworth with a seemingly slapdash attitude to food hygiene. I think I'd rather go to Lamberts, myself. There are Vietnamese food updates in the form of Dat Cang Supermarket and Mama Pho, both in Deptford. Also updated following a visit is vegan-friendly creperie Senzala, over in sunny Brixton. Closures to report: the Breadroom bakery in Brixton has literally ended up in Valhalla, while the Cineworld Hammersmith is to be demolished. I cannot confirm or deny that the last film to be shown in this (admittedly rather run-down) Art Deco building was Kung Fu Panda 3. Welcome back! 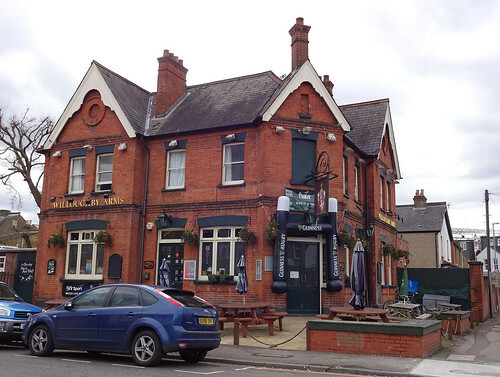 This week's featured article is The Willoughby Arms, KT2 6LN, a pub on the north side of Kingston. Of course, you knew that from the postcode, so I need hardly say. It's a handsome building from the photo, though what were once separate rooms seem to have been knocked through somewhat (as is the style). Go to drink Twickenham ales and watch cricket on the TV, still lovely despite a musty smell. 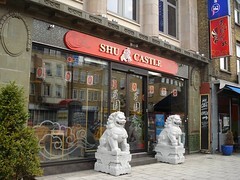 Two new articles are Sun Luen Snack Bar in Chinatown, with eggy egg tart; and House of Bottles, an off licence in Brixton. There are big updates to veggie favourite The Gate (their Angel Islington branch), and post-work vertical drinking favourite The Hope Fitzrovia, which used to be a nice pub once upon a time. Still, sounds like it might just be fine on a weekday afternoon if you're ever there at such a time. 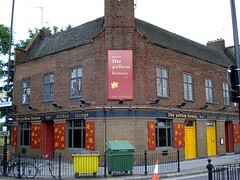 Finally, just to mark the reopening of Camberwell's The Bear pub, for which our write-up is sadly rather out of date. Sorry for the lateness, an extended holiday weekend means that we're a bit late getting this out. 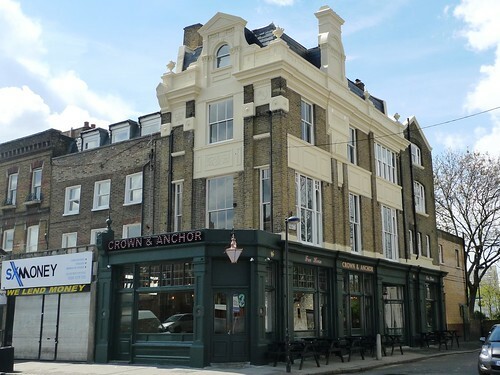 This week's featured article is The Crown and Anchor, another "craft beer" pub, this one from the people behind Stoke Newington's Jolly Butchers, but situated between Brixton and Oval. There are plenty of beers both keg and cask, and it seems promising. 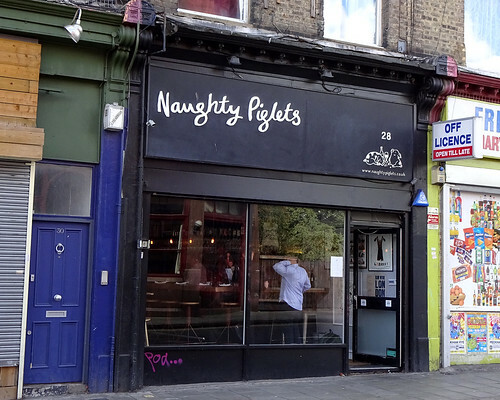 New articles are on: The Atlas, a gastropub near West Brompton station; The Holborn Whippet, another craft beer bar from the Euston Tap people; and Patterson's, a fine dining restaurant in Mayfair. Reported closures are: Sagar, a South Indian vegetarian restaurant in Twickenham; and Chennai, a South Indian cafe in Barking. One impending closure is Langton's Bookshop in Twickenham, due to close at the end of June. Sorry for the gap in service, as kake has been rather busy. However, I'm helping out and will run through the weekly updates. 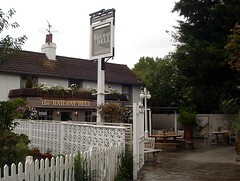 The featured article this week is The Railway Bell, TW12 2AP, a Good Beer Guide pub in Hampton. Since the last update the following pages have been added: The Railway Tavern Ale House, a reopened pub just near Dalston Kingsland with six ales and Thai food; The Breadroom, a cafe in Brixton Market; The White Swan, a Wetherspoon's at Highbury Corner; The Kentish Canteen, a cafe in Kentish Town; Ye Olde Swan, a Greene King pub, and The Red Lion, a slightly better pub, both in Thames Ditton (technically in Surrey); Pizza Napolitana, a takeaway in Croydon; Restaurante Santafereno, a Colombian restaurant in Brixton Village; Moyo-Ma, a Nigerian restaurant in Walworth; Tap East, a microbrewery and bar in Westfield Stratford City (E20); Cook Il Kwan, a Korean restaurant in New Malden; and The Anthologist, a bar in the City. Phew! Reported closures are: Positively 4th Street, a New York-style bar near Euston; The Queen Dowager, a Young's pub in Teddington; Somers Town Coffee House, a gastropub between the British Library and Euston; and Avella's Cafe, a sandwich shop just off the top of Regent Street. Future updates should be a little shorter, as we'll try to keep them regular. New featured article — Royal Standard, CR0 1SS. 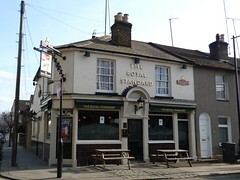 This week's featured article is Royal Standard, CR0 1SS, a lovely little Fuller's pub in Croydon. It has board games, a dart board, chairs with misericords, excellent pies, and a beer garden; and it's been one of my favourite pubs for quite some time. The big news on RGL this week is the addition of the Good Beer Guide 2012 category, plus all the pubs in it that we didn't already have listed. 36 new pubs were added to RGL, 18 of them with proper writeups (having been visited by me and/or ewan in the two weeks between my advance copy of the GBG arriving and the official publication date). The other 18 are currently "stub" entries which mainly contain addresses, opening hours, and links to other people's reviews; we'll be filling these in as soon as possible. Other recent additions to RGL include Okan, a Japanese restaurant in Brixton; Casa Morita, a Mexican taqueria in Brixton; and the Cow, a Geronimo pub in the exciting new postal district E20. Reported closures are Bombay By Night in Hampton, Donzoko in Soho, and Taste Of India in Covent Garden. 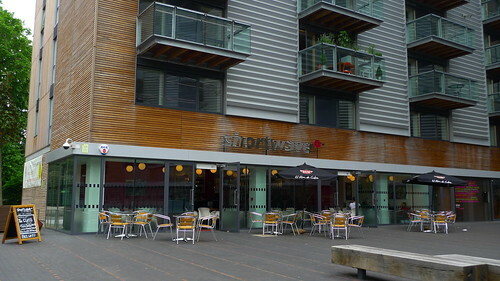 New featured article — Yellow House Bar, SE16 2UE. 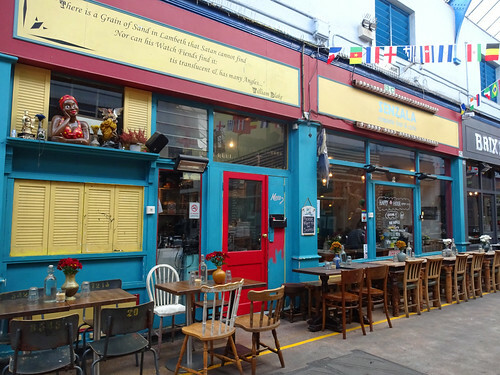 This week's featured article is Yellow House Bar, SE16 2UE, a restaurant/bar located in former pub premises opposite Surrey Quays Station. It has a proper wood-fired pizza oven, and also does pretty good brunch. Recent additions to RGL include Halfpipe in Maida Hill, Chinese Family in Greenwich, Simon The Tanner in Bermondsey, and Brick Box in Brixton. One reported closure: Princess Royal in Croydon. kake - New featured article — Royal Standard, CR0 1SS. 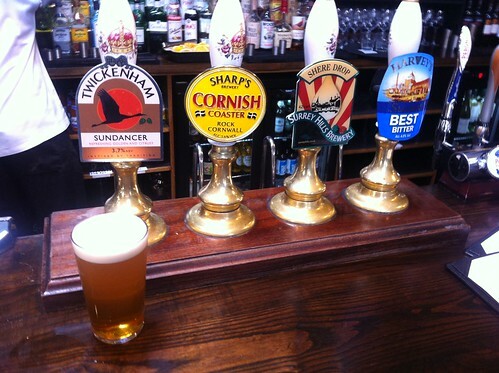 kake - New featured article — Yellow House Bar, SE16 2UE.